The Vampire's Hope is an interesting, quick read. This forty page novella tells the story of Ellie, a homeless dancer, who is made into a vampire one night. From there, she awakens in Master Liam's lair of Keres vampires. Ellie, an emotionless young woman, begins to feel something for Ian. Befriending her, Ian reveals some important information to her as they become romantically involved. 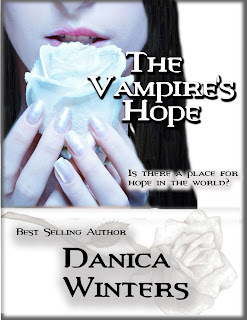 With aspects from mythology, vampire lore and romance, the author has set an interesting foundation for her paranormal series. I found some of the chapter transitions choppy, there were some parts where I was confused as to what had happened, and puzzled over a woman who has trouble feeling emotions could suddenly fall so quickly in love with a man she just met. I would have liked more about Ellie's transformation instead of just a quick note. Book source: I received a promotional copy from the author in return for my honest review during a book tour. This book sounds good. I like the excerpt, Thank you for sharing it!